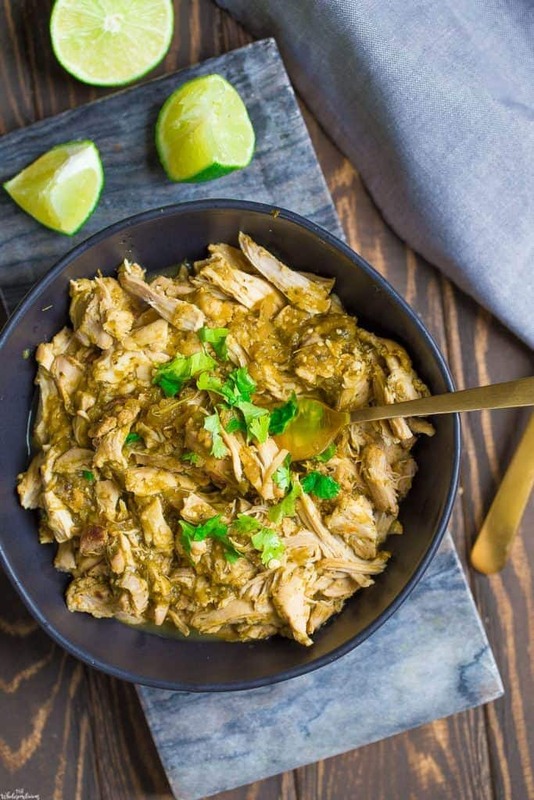 This Salsa Verde Chicken is a total game changer for any Mexican dish!! 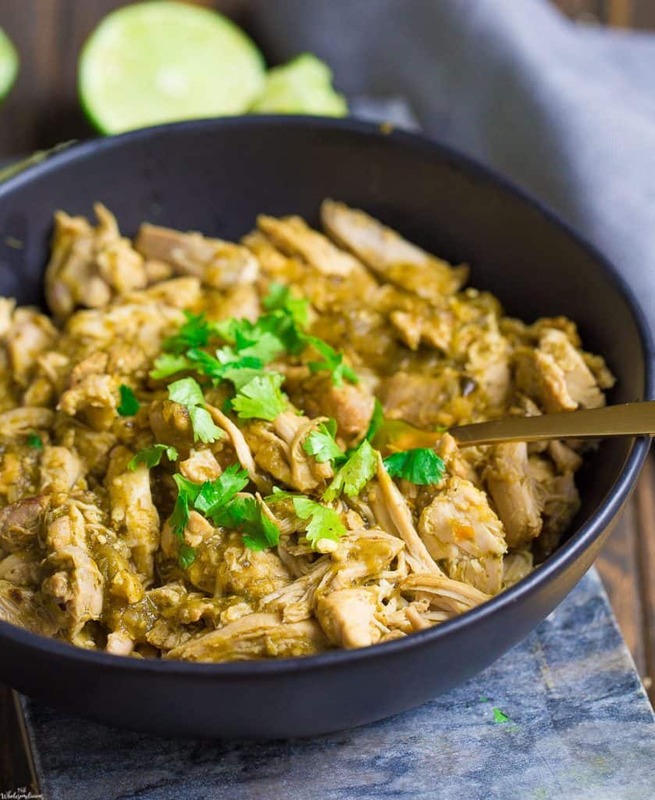 A delicious roasted tomatillo sauce is tossed into your Instant Pot (or slow cooker), to make the yummiest shredded and flavorful chicken. Put inside a taco, in a salad, or on a bed of rice for a versatile meal! Coming at ya this Saturday with yet another way to enjoy your beloved Mexican food: the Salsa Verde way. I love all foods green. In fact, I cannot think of a single green food that I don’t like. My love for Salsa Verde runs deep. It contains all my favorite green foods in one single sauce. It’s also one of my very first Mexican dishes I fell in love with as a kid. It wasn’t until I was an adult did I realize how it was actually made: green tomatoes, AKA tomatillos. You see, I used to hate tomatoes when I was little. Although I was a fan of salsa, I was convinced that green salsa was far superior because it didn’t have tomatoes. I would consume salsa verde by the spoonful, on top of my tortilla chips, smothered all over my burritos and nachos. I’ve always loved that stuff. 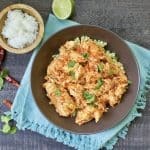 Now as a grown woman who still has a Mexican food obsession, salsa verde chicken is a recipe I make often. It makes such a great Taco Tuesday meal, or as a filling in enchiladas. I often use a jar of salsa verde from Trader Joe’s; it’s delicious! 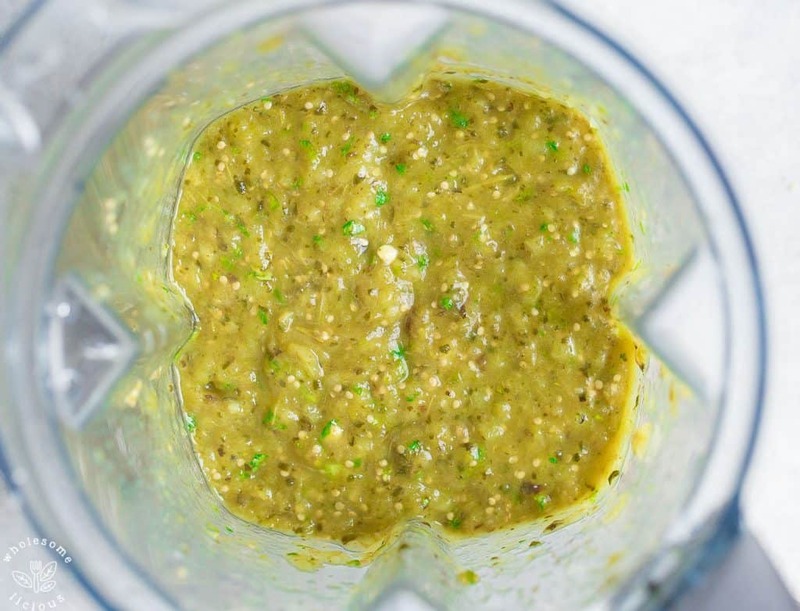 As delicious as it is, nothing compares to a homemade salsa verde sauce. It has this smoky, fresh, acidic, and tangy flavor that I LOVE!!! 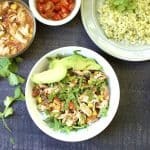 For this version of Instant Pot Salsa Verde Chicken, the homemade salsa verde sauce starts off with roasted veggies in the oven. 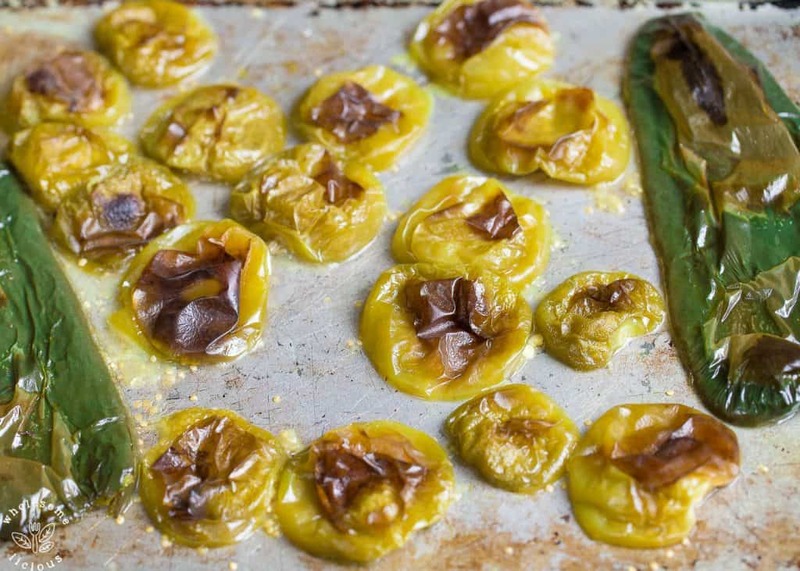 You will want a nice blistering effect on the tomatillos. Blend up with some lime juice, cilantro, and onion for the most incredible sauce! This easy dinner can also be made in the Slow Cooker, cooking on low for 4 hours. Begin by making your tomatillo salsa verde. Preheat your oven to 425 degrees. Slice the tomatillos in half and place cut side down on your baking sheet. Place the peppers cut side down on the same sheet. Lightly brush with oil, and place in the oven. Cook for 12-15 minutes, or until the tops of the veggies are blistered (see photo in post). Remove from the oven. Place roasted veggies, onion, cilantro, garlic, lime and sea salt in a blender. Pulse and blend for until smooth (don't over pulse). Now place the chicken in the bottom of your Instant Pot. Pour the salsa verde on top. Add chicken broth, and cumin. Secure the lid on your Instant Pot, ensuring the valve is turned to the sealed position. Select manual (or pressure for different models), and cook on high pressure for 10 minutes. Use a quick release and release all steam before opening the lid of your IP. Shred the chicken with a fork and serve, adding additional salt to taste. 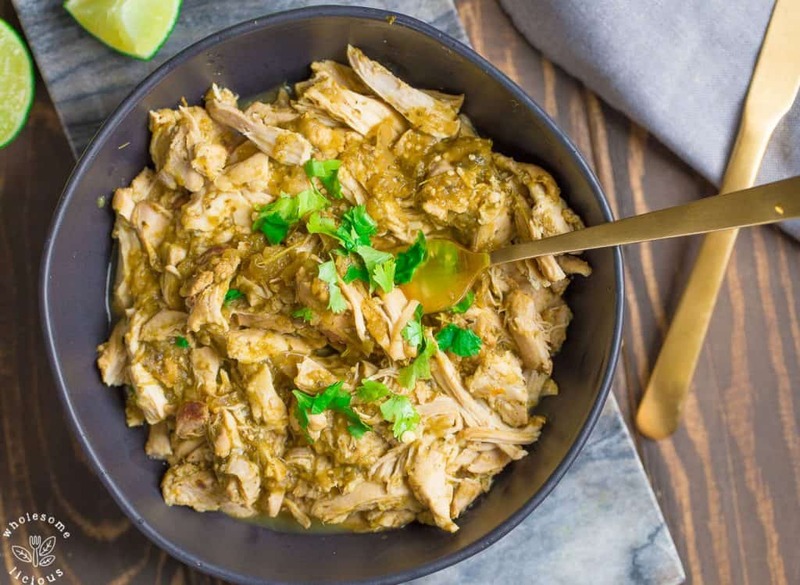 For the slow cooker, place chicken on the bottom of your slow cooker and top with salsa verde. You do not need the chicken broth. Add in some cumin. Cook on low for 4-6 hours, or until the chicken is fork tender. Ensure any visible fat is removed from the chicken thighs. How do you typically serve this? Lots of different ways: in a lettuce wrap, over greens in a salad with toppings, or over rice or cauliflower rice. with frozen chicken, it will be the same cook time, but it will just take longer to come to pressure. Hope you love it! I have a whole 30 compliant salsa Verde. If I use this, how much would I need? Hi Casey, I would use approximately 2 cups. Can you do this with frozen chicken? Sure, it will just take longer to come to pressure. Really? Only 10 minutes? Oh yum! Okay, this was delicious! 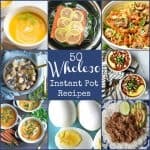 My first recipe in the Instant Pot, and I was thrilled! Note 1: The chicken breasts were defrosted beforehand, and it took a total of 13 minutes at high pressure for the meat to be cooked through (it was still juicy). I used organic chicken and organic broth. Note 2: While I fiddled with the recipe (slightly), I am an avid cook (and baker). It was just my first time with the Instant Pot, so having a recipe catered to the pressure-cooking method was of great help! Note 3: My cats were very pleased while I was shredding the chicken … until I covered the plate. Thank you, Amy 💕 This will be on rotation for sure! Glad you loved it Cassandra! I got a burn message. So I took it out, after pressure down and chicken was slightly brown, used breasts. So took it out sauteed 1/2 onion delazed put it chicken and salsa back in. Burn notice again??? 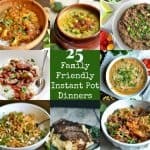 First time with Instant Pot, I must have done something wrong.??? Oh no!! So sorry to hear. Unfortunately, unless i’m in the kitchen with you it’s hard to tell what happened. Deglazing the Pot was the right thing to do. If I ever get a burn message, I also add in another 1/4 cup to 1/2 cup more liquid.